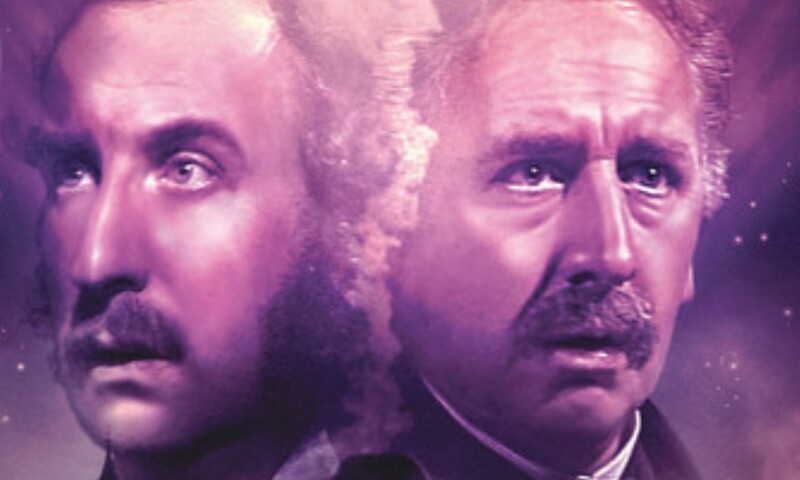 The script, from Andy Lane, makes great use of the Companion Chronicles' format of narration, using Jago and Litefoot who are telling the story to each other. Sitting in a Victorian tavern, they relate their separate adventures, which prove to be part of the same - larger adventure. This is something which leads to some good natured humour, with Jago and Litefoot arguing over which segue is more important to the story. While this enjoyable at first and leads into a great cliff-hanger, it does get a little tiresome towards the end, but looked at generally, the comic double act is cleverly written so that it escapes being a nuisance. But the final point of the plot sees Lisa Bowerman playing the barmaid Ellie, who does appear in the Jago and Litefoot series proper and it is completely pointless. Sure, Bowerman is as entertaining as usual but Ellie isn't used as anything other than a cypher and doesn't bring anything else to the table. But what about the story proper? Well, the police have brought a new body to the morgue run by Litefoot, but it is a most unusual corpse, while Jago is off investigating a mysterious smell at Suffolk Wharf. The story is about the mysterious plot which links these two stories together. (Though I wouldn't recommend reading the back cover to the CD release, as it gives you the entire plot!) What doesn't help this story is that it is almost entirely put over to us listeners through narrated dialogue, especially in one scene where the entirety of it is given to us through some exchanges between Jago and Litefoot. There are a few moments of action which litter the story but are mostly about the two rushing from place to place and there is very little in the way of tension. We get nothing that doesn't regularly feature in a Doctor Who audio release anyway abruptly followed by such an anti-climax, that it is hard not to see this story as something of a disappointment. And on top of that, the story leaves one major plot thread unsolved. Even if this was a jumping on point for the larger Jago and Litefoot series, it does nothing but undermine this story. With this release, you get a beginning, no middle and part of an end. Since the story focuses on Jago and Litefoot, there is no call for any kind of character development, since they aren't really characters in any literary sense. The class difference between the characters is acknowledged but made nothing off, so that it doesn't get in the way of the story. Themes like this take a backseat through the story, though we do get some effort to tell us how horrible life was for the lower classes in Victorian times were. But all this does is draw attention to itself without ever saying anything. What really stops the plot from dragging the story down is the performances from Christopher Benjamin and Trevor Baxter, who make the friendship between Jago and Litefoot feel real, even if some of the scripts' humour threatens to bog things down. And in narrating the story, they bring a little irony to the ridiculous proceedings. There are a couple of instances where the age differences between the actors and the characters is obvious and detracts from their performances slightly. But for the most part, their work is just so skilful that this doesn't become a large problem.